Multifamily investment in Colorado Springs will continue to lure new investment and acquisition from large market investors. Denver apartment investors, in particular, see Colorado Springs apartments as a “safe haven” from the risk in their potentially overbuilt market. Colorado Springs has been experiencing strong job growth across various sectors and will continue to have strong population growth, both of which bode well for multifamily investment. Apartments will respond with historically high occupancy and rent growth. At present, Colorado Springs apartment rent growth is accelerating, currently about 9 percent. Vacancy rates have fallen below 4 percent. Conversely, apartment vacancy is increasing in Denver and Fort Collins, Loveland and Greeley. Rent growth has slowed in those markets. Still, Colorado Springs rents remain considerably below Denver, which is part of the reason forecasts are positive. Additionally, average rent compared to median income still is reasonable in Colorado Springs compared to Denver. 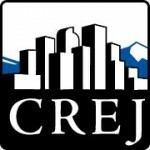 This has, in fact, lured many people to reside particularly in northern Colorado Springs while working in Denver, where salaries are significantly higher. Colorado Springs rents by comparison are still affordable and have room to move higher, which is much of the reason that multifamily construction is robust and forecasted to continue on its current expansionary path. Population and job growth. El Paso County, which holds the vast majority of the population for the Colorado Springs metropolitan statistical area, has had population growth of 1.9 percent since the early 2000s. This is roughly double the population growth rate of the U.S. as a whole. 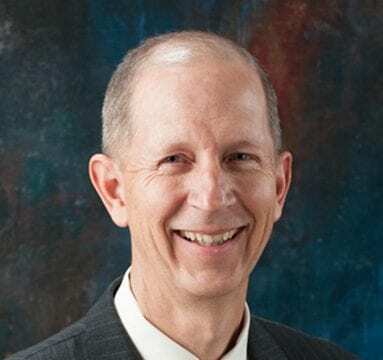 The past growth will be eclipsed by future growth – El Paso County is one of four counties in the state projected to have a population increase of at least 300,000 people between 2010 and 2040, according to the State Demography Office. 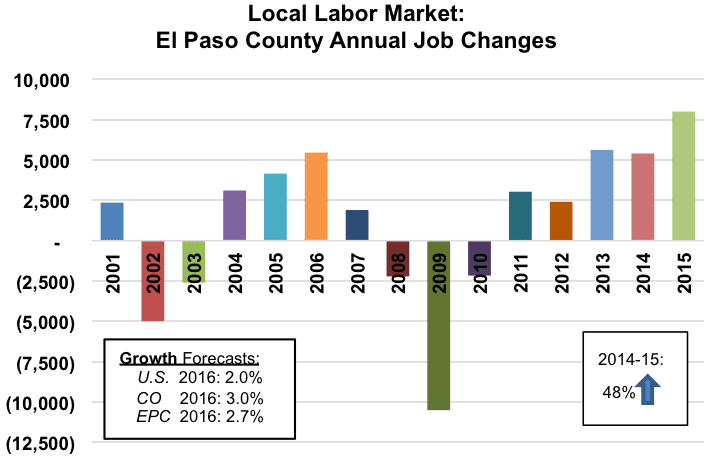 At the current pace of growth and with the given age composition, El Paso County needs approximately 5,400 new jobs to be created per year. The region was woefully behind this target number throughout all of the 2000s except for 2006. Throughout the recession and during the early years of the anemic recovery, there were significant job losses. However, in 2013 and 2014, the region met that target and exceeded it in 2015, which brought 8,004 new jobs to the region, according to the Bureau of Labor Statistics. The positive trend continues with 8,283 new jobs from first-quarter 2015 to first quarter 2016. The new jobs primarily are concentrated in relatively higher-paying sectors: health and education services, professional and technical services, and construction. This trend should continue. The Colorado Department of Labor projects the highest rates of employment growth to be in these sectors from 2015 to 2025. Furthermore, the September median salary in Colorado Springs for current job postings is now higher, at $66,425, than the Colorado median, at $60,025. The current regional median is a whopping 20 percent higher than it was in April 2015, so the higher regional salary is a relatively recent phenomena. The healthy job growth and concomitant salary increases have large implications for all residential real estate, including multifamily. Fort Carson. The common perception is that the Achilles’ heel of Colorado Springs is that it is susceptible to military cutbacks. Although it is true that the region has five military installations with a combined employment contribution in 2015 of approximately 55,000 workers, including active duty and contractual workers, this still only represents 17.7 percent of all workers in the region. An often-cited and incorrect statistic is that the military represents 50 percent of the local economy. That is simply untrue. There is no question that base closures would cause negative ramifications for the tax base, the real estate market and, in fact, the entire local economy. However, the current, positive trajectory with new jobs in high-skill sectors alongside the statewide in-migration of highly educated people implies that the past reliance on the military is dwindling. This is a good thing – economic diversity is insurance against disproportionately harsh (local) downturns. Vacancy: 3.6 percent. The demographic and economic growth has translated into a healthy multifamily market. The citywide average vacancy rate for Colorado Springs is at a historic low of 3.6 percent in September. This is a significant 38 basis points drop from the last quarter, and 115 bps below the year-ago average vacancy rate of 4.7 percent. The trailing four-quarter average vacancy rate decreased by 29 bps to 4.1 percent, a new record low for the past 10 years. The overall vacancy rate, including properties in lease-up, moved up 85 bps to 5.4 percent. However, this is still well below the year ago rate of 6 percent. Vacancy for all major age groups was below 4 percent with one exception. Properties built during the 1990s posted an average rate of 4.2 percent. The other age groups fell within a narrow range of 3.4 to 3.9 percent. The greatest improvement occurred in the newest age group – those built since 2010. Vacancy fell a significant 233 bps during the quarter for these newer properties, down from 6.2 to 3.9 percent. Rents: $948 per month. The citywide average rent for the metro area increased by a record $37 this quarter or by 4 percent. The largest previous gain was $24 during third quarter 2014. The annual gain in rent increased by $79, for a 9 percent growth rate, also a record. All age groups posted healthy rent increases during the quarter, resulting in annual growth rates from 5.7 percent for the newest properties to 10 percent for properties built between 2000 and 2009. Sales: $93,100 per unit. Year-to-date there have been 10 sales with 1,954 units, compared to last year’s total of 29 sales with 4,716 units. The average price per unit has increased from last year’s $86,700 to $93,100, an appreciation rate of 7.4 percent, despite an average age of communities sold that is four years older than last year. Under construction:1,300 units. Colorado Springs has 1,300 apartment units under construction with 1,900 units planned. This compares to Denver’s 25,000 apartment units under construction with 26,000 units planned. Unfortunately, Colorado Springs was late to the party with economic recovery and rent growth but, thankfully, Colorado Springs was late to the party with rent growth and new construction. Like many other second-tier cities, Colorado Springs is now experiencing the post-recession economic expansion and corresponding real estate growth. Absorption has been strong, keeping up with the new construction. This scenario alongside the broader population growth is luring outside investment. However, while these improving conditions are motivating developers to build new product, the reduced availability of construction financing will likely keep a lid on the supply of new apartments. This may not be a bad thing. It may insulate Colorado Springs from the over construction that some first-tier cities are experiencing that can result in the painful burst of a bubble. Featured in November issue of Multifamily Properties Quarterly.